Is there any vegetable prettier than an eggplant? The smooth, shiny purple skin, the creamy white flesh…such a pretty addition to dinner. I have to admit, though, I’m not a huge fan of the taste of eggplant! Even so, I usually have some eggplant growing in my garden and in the winter I often find myself buying them at the store anyway, hoping that this time I’ll find just the right recipe to make me love the taste as much as I love the way they look. Then I ran into this recipe at Elieen’s Everyone Eats Right blog! Savory Eggplant Jerky is a great way to enjoy eggplant while snacking on something that is as satisfying as beef jerky. Eggplant jerky tastes a little like beef jerky, and a little like bacon. It’s not hard to make! 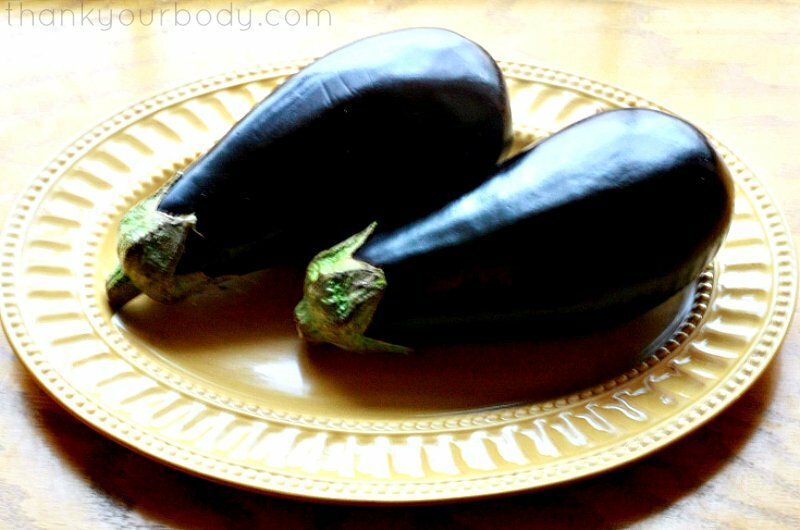 Just wash some organic eggplants, and then slice them very thin. You’ll want to be careful, the skin is slippery and it’s easy to let the knife get away from you. I cut the eggplants in half lengthwise and crosswise, then I cut a little off the rounded bottom in order to give the vegetable a place to rest as I carefully sliced it. Once the eggplant was sliced, I cut it into jerky-sized pieces. When the eggplant are cut, mix up a marinade of organic cold pressed olive oil, balsamic vinegar, maple syrup, organic pressed garlic, sea salt and cracked pepper. To give the jerky a nice smokey flavor, I also added a few teaspoons of organic smoked paprika (like this). Mix the eggplant slices with the marinade and allow them to sit at least 2 hours. One of the great things about eggplant is that it soaks up sauces and marinades well, so the flavor will permeate through the jerky. When it’s ready, lay the slices onto parchment paper lined cookies sheets (for oven dehydrating), or place them on the racks of your food dehydrator. Sprinkle on a little salt and/or cracked pepper before you start dehydrating. I discovered that by using some stack-able metal cooking racks, I could conserve oven space and dehydrate more eggplant at a time! Allow the eggplant jerky to dehydrate (10-12 hours on your oven’s lowest setting, or 12-18 hours in your food dehydrator). Now you’re ready to enjoy it! Road trip, anyone? Have vegan jerky, will travel! I’m excited to find this savory, chewy way to enjoy the prettiest vegetable in my garden. Savory Eggplant Jerky is a great way to enjoy eggplant while snacking on something that is as satisfying as beef jerky. Adapted from this recipe. Wash and carefully cut the eggplant into thin slices. It helps to quarter the eggplant, then cut the rounded bottom off before you slice it. Cut the eggplant slices into jerky-sized pieces. In a large bowl, combine the rest of the ingredients and stir well. Toss the eggplant slices with the marinade, and set aside for at least 2 hours. Lay the slices on parchment paper lined cookie sheets (for oven dehydrating) or on the trays of your food dehydrator. Sprinkle the jerky with salt and cracked pepper. Dehydrate on your oven's lowest setting for 10-12 hours, or in your food dehydrator for 12-18 hours at 115 degrees. What’s your favorite eggplant recipe?